Consists of 35 pieces regular size chocolate cupcakes with buttercream frosting this pull apart cupcakes cake is absolutely HUGE and HEAVY! Because of its large size it has no room for error, must say I was very pleased with the result, one happy cupcake artist here. 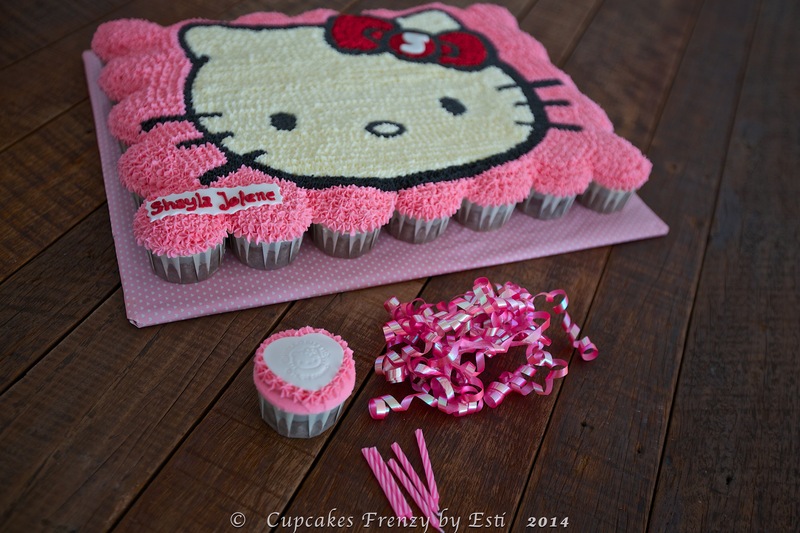 I also made an individual Hello Kitty cupcake for the birthday girl who came along to collect the cupcakes cake with her Dad. This entry was posted in birthday, buttercream, cameraholic, celebration, Cupcakes, favorite, note from the baker and tagged 5th birthday, buttercream frosting, chocolate cupcake, edible art, Gift Ideas, hello kitty, hello kitty cupcake, hello kitty pull apart, love, Manila, pull apart cupcakes cake. Bookmark the permalink.